Time for the first review of August, and boy, is it for a game that I've been hankering to play for months now. It's the 2016 reboot of a PlayStation franchise that began in 2002. It's Ratchet & Clank on the PlayStation 4, and here is the SuperPhillip Central verdict. The PlayStation 4 is starting to really get its first party presence down immensely this year. With both Uncharted 4 and this new Ratchet & Clank game, things are finally getting quite exciting with Sony's first party offerings. Ratchet & Clank is without question my favorite first party game that the PlayStation provides. Its blend of third-person shooting action, platforming, and humor usually always makes me smile. 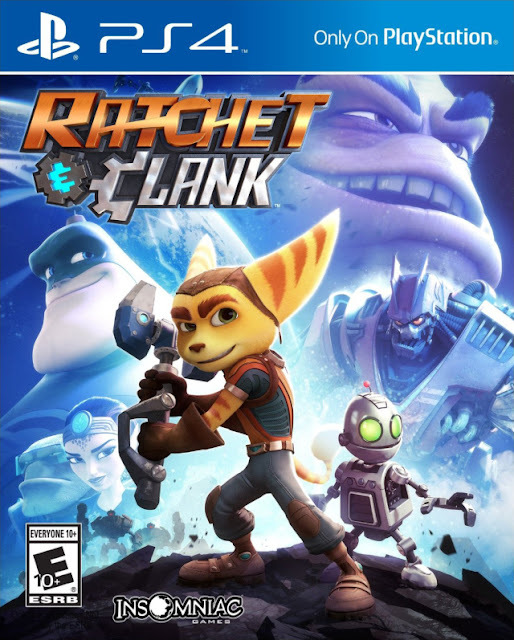 After multiple entries in the series, a new movie has released, and the game based off this movie takes the Ratchet & Clank series back to square one, doing a remixed retelling of the 2002 original game. Mixing things up considerably while presenting the fine, fun, and familiar gameplay fans like myself have come to expect from Insomniac's series, Ratchet & Clank as a reboot is sublimely done, and it's one of the best games of 2016 so far. Our tale begins with Ratchet, a lombax, who spends his days on Planet Veldin, helping out old Grim at his garage. Upon hearing about the Galactic Rangers holding tryouts nearby, Ratchet races over to show his best to the head of the Rangers, the egocentric and slightly eccentric Captain Qwark. Upon getting the cold shoulder by Qwark, Ratchet mopes around the garage until a fallen spacecraft crashes nearby, containing a mild-mannered robot named Clank. The two quickly get along, and Clank informs Ratchet that the nefarious Chairman Drek has a plan in store to reek evil across the galaxy. 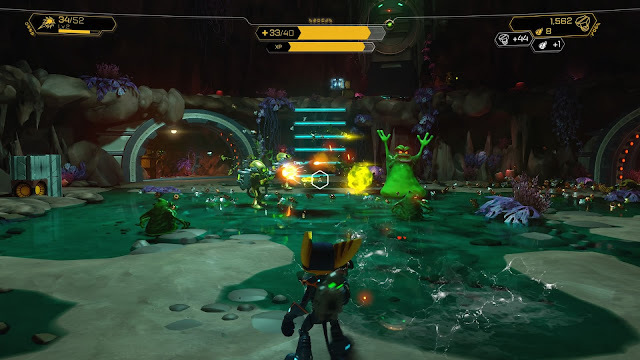 With Clank in tow, Ratchet leaves his home, Veldin, starting the events that follow, leading to Ratchet joining up with the Galactic Rangers and doing his best to foil Drek's plans. Ratchet & Clank's story features gorgeous cut-scenes full of the series's trademark humor and wit. The characters, down to the one-off characters, exude personality and charm. 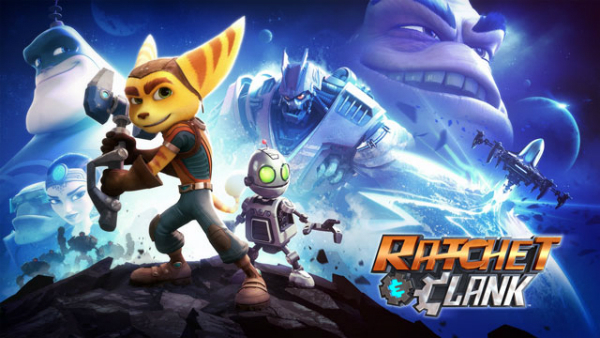 Those expecting the same retelling of the original Ratchet & Clank on PlayStation 2 from 2002 will see a brand-new tale, based off the movie that released earlier this year. The game expertly weaves in scenes from the movie while bringing enough exclusive narrative content to make for a riveting tale, even if you've already seen the film. What isn't too terribly different is that Ratchet & Clank plays like any other game in the series, but that's definitely a good thing. The heavily and finely honed run and gun gameplay that the franchise is known for is here and accounted for, while bringing lots of new enhancements to make for a better experience for players. For instance, in past Ratchet & Clank games, gadgets like the Swingshot took a spot in players' quick select menu. This meant that to use the Swingshot, the gadget used to cross chasms like a grappling hook, had to be selected each time you wanted to use it. In this new game, the Swingshot, or any other necessary gadget, is equipped automatically when you're nearby the target to use it on. Now, this doesn't work well 100%, as it's a pain when you're in the middle of a battle, and you're nearby a Swingshot target, because instead of firing your weapon (which is the same button as your gadget button), you might use the Swingshot by mistake. Old locations like Planet Novalis feel new again in this reboot. The original Ratchet & Clank by today's standards, especially compared to more modern games in the series, much less its subsequent sequels on the PS2, feels rather dated. The lack of being able to strafe while firing was a big oversight, but this PlayStation 4 reboot features this ability, making aiming and shooting at a foe while keeping your attention focused on them easy. You don't have to worry about changing Ratchet's direction while he (hopefully) dodges, evades, and jumps over enemy shots and attacks. Another enhancement to this reboot of Ratchet & Clank that the 2002 original lacked is the ability to level up the various guns Ratchet utilizes throughout his adventure. As you move on from planet to planet, the inventory of in-stock weapons at the Gadgeton vendor, a vendor that is located at multiple locations in each of the game's areas, increases, offering new weapons to purchase with the bolts dropped from enemies and found in crates. These weapons range from multiple fire handguns to more powerful weapons like rocket launchers and grenades, to more innovative weapons like the Groovitron, which launches a disco ball, forcing any nearby enemy to break into dance while Ratchet can pick them off. Then there's the old standby Mr. Zurkon, a mobile hovering robotic sentry that backs Ratchet up for a brief period of time, launching miniature missiles into foes all the while taunting foes. Sandsharks? Kill 'em with fire with the Pyrocitor! Repeatedly using guns while making sure Ratchet's shots hit their intended target slowly levels a given gun up. When it gains enough experience, it levels up, making it stronger. In the main game you can build up a weapon to level five. Raritanium, an ultra powerful and strong ore, dropped occasionally by fallen enemies and located in hidden ore mounds, can be used at Gadgetron vendors to upgrade weapons. This can be used to increase the ammo count of a weapon, how many bolts enemies dropped when defeated by said weapon, and countless other benefits and bonuses. In the original game, Planet Batalia was a rain-drenched battleground. Here, it's all iced over. 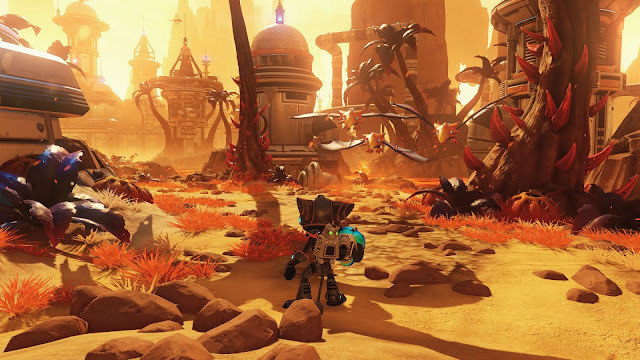 The level design of Ratchet & Clank is comparable to past games in the series. Many locales will feel familiar to players of the original game. Some locations are near exact compared to the 2002 original, while others have gotten a great overhaul. Each planet generally has at least two objectives to complete that are mandatory to progress. Each objective generally opens up another planet for the lombax and robot duo to venture to. There are usually two main paths to take on a planet, with each having Ratchet reach a different objective. The paths themselves have a strong sense of linearity to them, but the amount of secrets that are held when you go off the beaten path is immense. From Gold Bolts, the main hidden collectable in the game, which unlock cheats for players to use, as well as Holo Cards, a new collectable introduced to the series, there are a lot of goodies to be found for the exploring types. Holo Cards can be found in packs as well as dropped by defeated foes. These each depict a character, weapon, enemy, or setting from the Ratchet & Clank series. Collecting a set, a trio of themed cards, unlocks new bonuses for the player, such as an increased chance for enemies to drop more Holo Cards or Raritanium, or increased bolts. Two enemy forces fighting against each other? Let 'em fight. 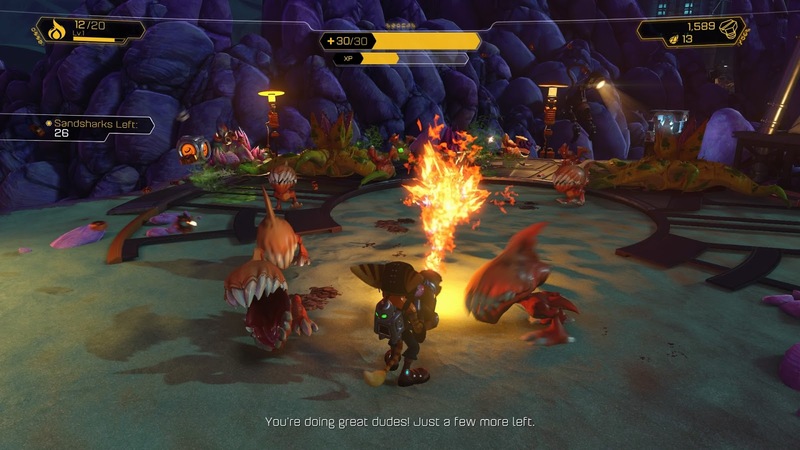 Early Ratchet & Clank games became a slog to replay at certain points due to having to play as Clank. In the original Ratchet & Clank, sections where you only played as Clank were tedious, as you had to command robots to do tasks that took some time to do while you watched from a distance. In this PS4 reboot, these sections have been replaced. Clank still interacts with other robots, but this time he can carry them and transform them into one of three forms: a Power Bot, that charges conduits to open doors; a Spring Bot, used to bounce to higher platforms; and a Bridge Bot, used to anchor to specific spots to create bridges for Clank to cross. Later levels with Clank on his lonesome feature using a combination of the three to solve increasingly more challenging environmental puzzles. These sequences also play much more quickly than in the early Ratchet & Clank games, making repeated play-throughs much less of a hindrance. Speaking of repeated play-throughs, after beating the main campaign of Ratchet & Clank, which will take about six or seven hours depending on your skill level, the option to play Challenge Mode is unlocked. 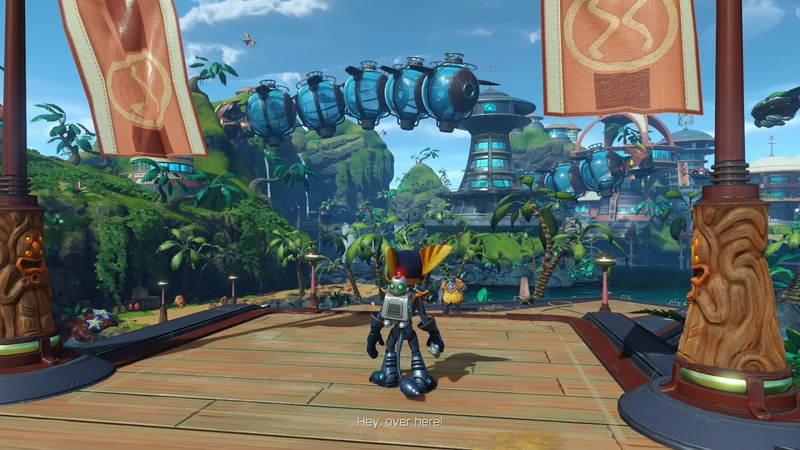 This starts you from the beginning of the game with all of Ratchet's current weapons at the current levels, and current maximum health. Not only is there a bolt multiplier now in play, ever increasing up to give up 20 times the regular amount of bolts as players continually defeat enemies without taking damage themselves, but now earned weapons can level up to 10. However, the means to acquire the ability to get weapons past level 5 has changed. Earning specific Holo Card sets unlocks the ability to buy stronger versions of Ratchet's weapons at a Gadgetron vendor. When a more powerful version of a weapon is earned, the player can then level up the weapon more, all the way to level 10. A planet so hostile that even the birds want to harm old Ratchet. 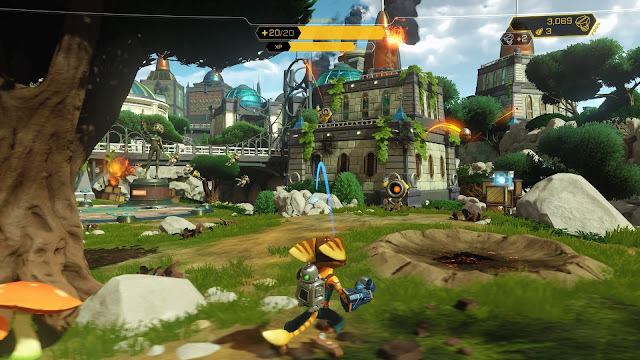 I always assumed that people who were clamoring and claiming that Ratchet & Clank on PS4 looks like a Pixar film in video game form were heavily exaggerating the graphics of the game. Seeing how well everything animates, how crisp and well detailed character models and environments look, and viewing it all in a silky smooth frame-rate has me convinced otherwise. Ratchet & Clank is one of the most beautiful games I've ever seen, cartoon-y or not. The environments are jaw-dropping, the level of detail is immense, and the immaculate attention to creating a believable fictional cartoon world is amazing. Screenshots like this are easy to ogle at their beauty, but just wait until you see it in motion! The sound also delights, offering wonderfully done voice acting that walks the line between a cartoon and a drama without falling too much onto either side of the equation. The music is bombastic, accentuating the action at every conceivable moment. It all adds up to a presentation that absolutely floored me. 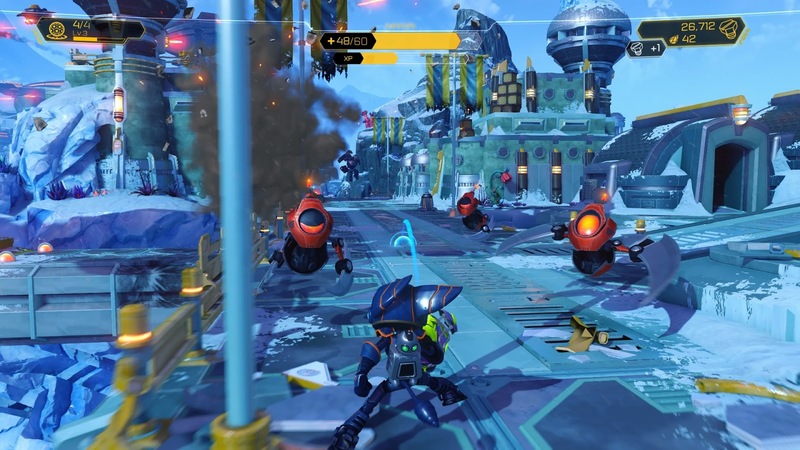 Ratchet & Clank's 2016 reboot is a stunning display of action-centric platforming gameplay and high octane visuals. It's a game whose pace seldom dulls or lessens, always bringing something creative into the fold whether conceptually or gameplay-wise. The team of Ratchet and Clank have rarely looked, played, and felt as good as they do with this year's impressive romp. Some very minor camera and control issues mar the experience just slightly, but overall, Ratchet and Clank's latest is one of their best adventures together, and it makes me look forward to where they head to next.